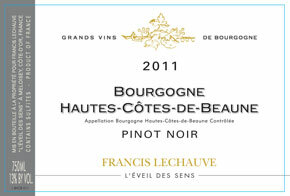 Francis Lechauve is truly a modest man and let’s his wines do the talking. He grew up in the small wine-making town of Meloisey and started working in the vineyards, helping out his neighbor at the age of 12. Anthony and I are particularly excited by this excellent find in the heart of Burgundy. When I first moved to Burgundy to source wine I had a fear: Burgundy is so “hot” right now, all the good producers already have importers. When I found Francis Lechauve located in the picturesque village of Meloisey, a couple kilometers north of St. Romain I was so excited and impressed by his wines that I took everything I could. We really hit the jackpot with this traditional, high-quality Burgundian producer. As you know, all our wines are blind tasted against other wines from the same appellation before being selected. 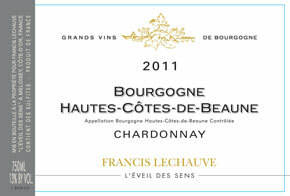 Lechauve was the only producer to have wines place in both the white and red category. Of course, we are not the only ones to love his wines as he received the highest score in the Guide Hachette ( One of the most highly regarded wine reviews in the world) and medals at the prestigious Burgondia tasting event. From the time I gave Mr. Lechauve verbal confirmation that I would take his wine until the time we actually signed the paperwork he lightly complained about his phone ringing off the hook as importers from Korea to Australia were trying to get his wines. 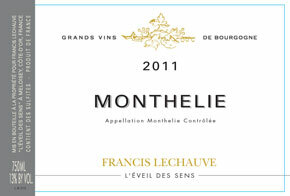 I cannot sing the praises of this producer enough, his wines are simply exceptional and we are luck to be his importer. 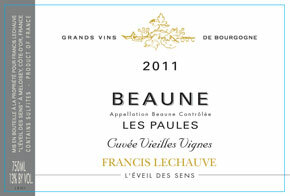 Francis Lechauve is truly a modest man and lets his wines do the talking. He grew up in the small wine-making town of Meloisey and started working in the vineyards, helping out his neighbor at the age of 12. He attended the lycee viticole in Beaune (wine-making high school) and at the age of 17.5 started working at Bernard Fèvre in St. Romain and then Henri Mussi in Pommard. 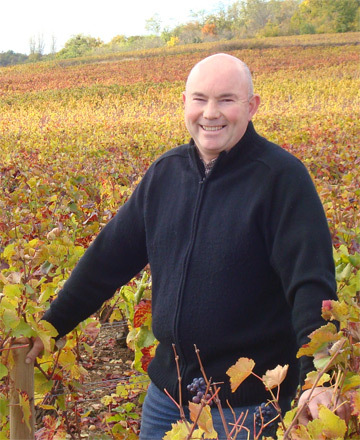 In 1989 he started working at Douhairet Porcheret in Monthelie for 17 years before starting his own domaine. In case you are counting, by the time Mr. Lechauve would have been able to legally drink in the US he had been working in the vineyards for 9 years, had completed a wine degree and had spent almost 5 years working for a wine producer. 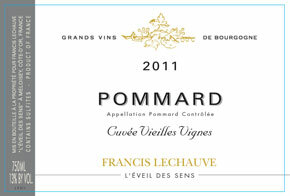 Mr. Lechauve puts as much care into his Haute Cotes as his Pommard. 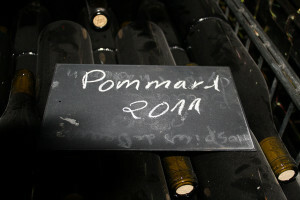 When I tasted with him many months after harvest he still had not put his aligote from the previous harvest in bottle. He told me he was in no rush and preferred a longer elevage. Sorry, this one is already sold out. Francis Lechauve explained to me that he is “old-school” all his vineyards are harvested by hand (not always common practice for vines in the Hautes Cotes appellation) and during harvest his workers have a well-merited “casse-croute” (essentially everyone breaks bread together). His grapes are sorted once in the field and again in the winery. For his reds he uses 20-35% new oak as to not overpower his wines and of course only indigenous yeasts. For the whites, all the wines are vinified in the same way. Really the difference comes from the terroir and the uniqueness of the appellations. The Vineyard: There is no herbicide used. Average age of vines is 50 years. Mr. Lechauve works the domaine’s 8 hectares himself, doing the tractor work himself. As is tradition, Mr. Lechauve does not prune until after the St. Vincent that is after January 25th. Vinification: All the grapes are sorted at the winery, and then the grapes go directly into the pressoir. After, they rest for 24 hours and “deborbage” – clarifying. Once the unwanted lees are removed the clear juice goes into oak where it ferments (natural/indegenious yeasts). The fermentation takes place in barrel and could last anywhere from 1 to 3 months or more. 100% oak, with 30% new oak for 13 months . Average age of vines is 60 years. Mr. Lechauve works the domaine’s 8 hectares himself, doing the tractor work himself. As is tradition, Mr. Lechauve does not prune until after the St. Vincent that is after January 25th. Vinification: All the grapes are sorted at the winery, de-steemed at 90% followed by a relative long fermentation [20-25 day maceration]. Natural/Indigenous yeast used in the fermentation in stainless vats. The juice is then taken from the tank, lightly pressed and put into oak barrels (a portion new (15%) and the rest old oak). The vines are grown in Meloisey a commune well known for the quality of their HCB, the area has soil similar to Pommard and makes for very rich and concentrated wines. Typically there is no herbicide used but given the vintage they reserve the right to do so. Mr. Lechauve works the domaine’s 8 hectares himself, doing the tractor work himself. As is tradition, Mr. Lechauve does not prune until after the St. Vincent that is after January 25th. Vinification: All the grapes are sorted at the winery, de-steemed at 90% followed by a relative long fermentation (natural/Indigenous yeast) in stainless vats of anywhere from 15-25 days. Minimal to no filtration is usual. The juice is then taken from the tank, lightly pressed and put into oak barrels (a portion new (15%) and the rest old oak). Usually about 12 months of aging in barrel. Average age of vines is 50 years. Harvest: 100% hand harvested Vinification: All the grapes are sorted at the winery, de-steemed at 90% followed by a relative long fermentation [20-25 day maceration]. Natural/Indigenous yeast used in the fermentation in stainless vats. The juice is then taken from the tank, lightly pressed and put into oak barrels (a portion new (15%) and the rest old oak).